We had a fantastic stay at the Boulder Bear Lodge. 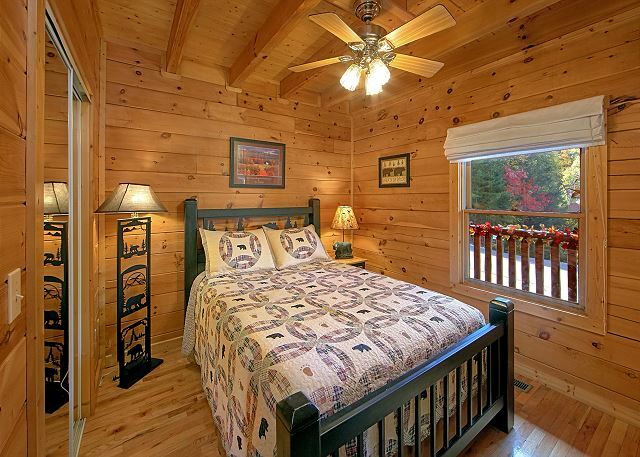 The cabin is so cozy! It had everything we needed to make our stay comfortable. 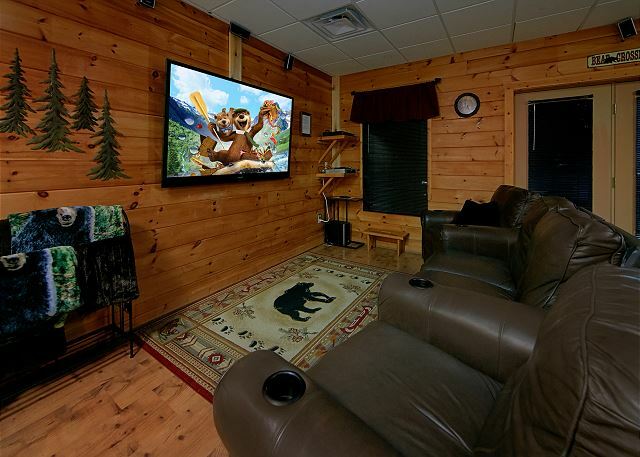 We enjoyed the theater/game area and the hottub. We prepared several meals in and the kitchen had all the cookware that we needed. The location is perfect. It is in a quiet area but very close to the Parkway. We loved it and can't wait to do this trip again. We had a very pleasant stay. The cabin was well maintained and in a good location. The juke box was out of order but otherwise everything was functioning. We had a wonderful and restful time - our group consisted of a granddaddy, grand mommy, mom and dad, and 1.5year old Harrison. 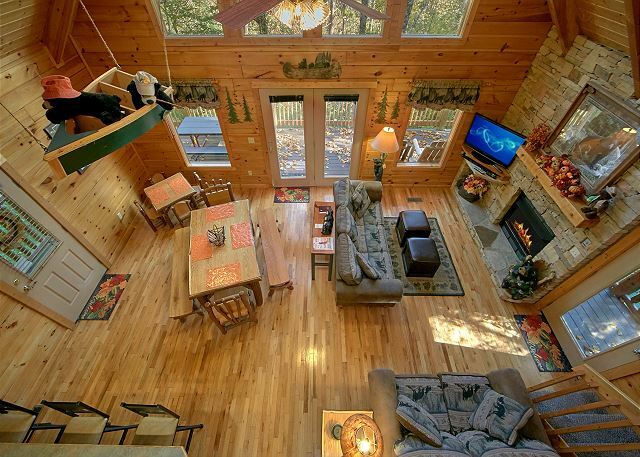 The cabin was perfect... mom and dad in the bottom floor - Harrison in the middle and the grandparents on the top floor. Close to everything - a great place, as long as you don't mind hills, to walk. We could not have had anything better. The cabin was everything it said it was... 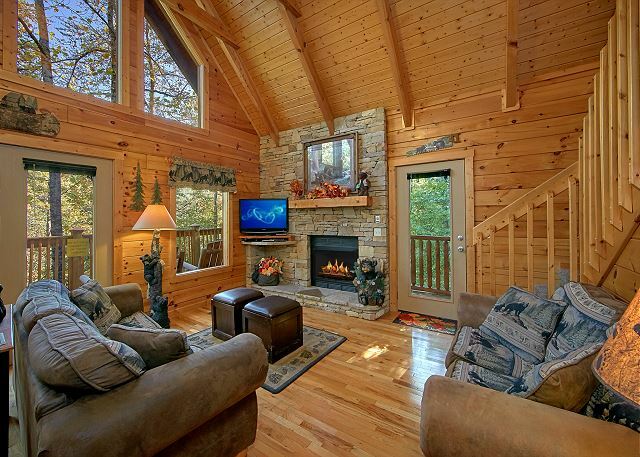 The layout was perfect for our family vacation to the Smokey Mountains.. .. Very convenient to all attractions... 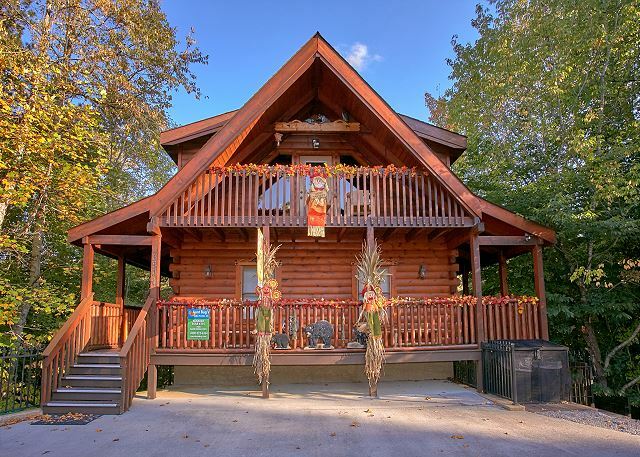 I would definitely use Aunt Bugs Cabin Rentals for my next trip to Pigeon Forge... The cabin was decorated very nice for the Christmas season.. Thank you Aunt Bugs for providing such a lovely cabin for us to stay in for our annual ministry staff retreat. 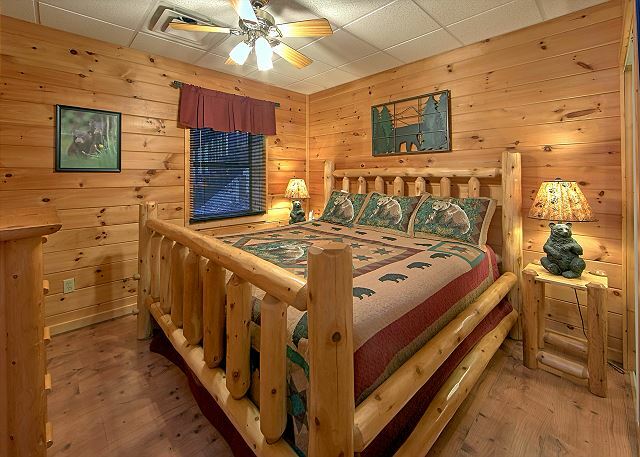 The Boulder Bear Lodge was perfect for the six of us! It was very clean!!! We arrived very late in the evening and our directions and paperwork were left just as they said they would be. Finding the cabin was easy and the staff was very accommodating when we checked in the next morning. We are already planning two other events for this year and will definitely rent from Aunt Bug's again! WE HAD A WONDERFUL TIME. THE CABIN WAS CLEAN & VERY NICE. IT WAS IN A GREAT LOCATION. THE RENTAL MANAGEMENT STAFF WAS VERY HELPFUL, POLITE & CURTIOUS. 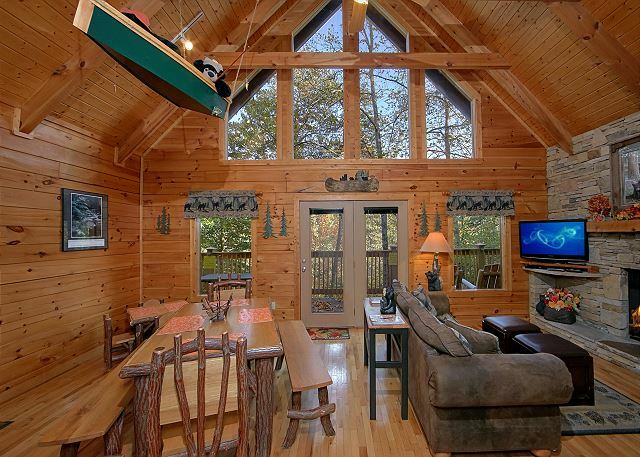 I WOULD RENT THIS CABIN AGAIN. This was a wonderful place to stay!! Wonderful cabin. Well kept. 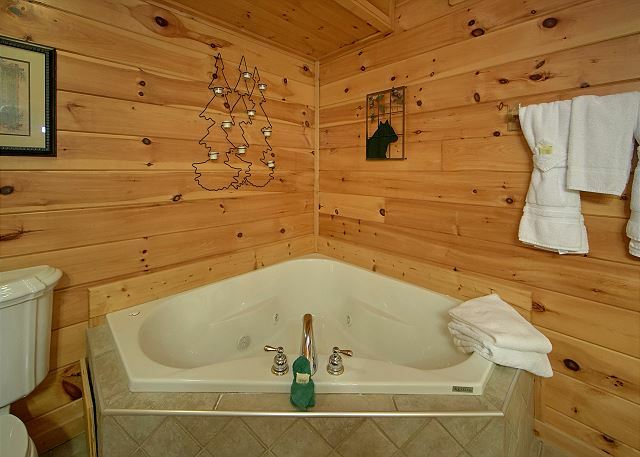 All the amenities! Very Clean. Would stay here again! 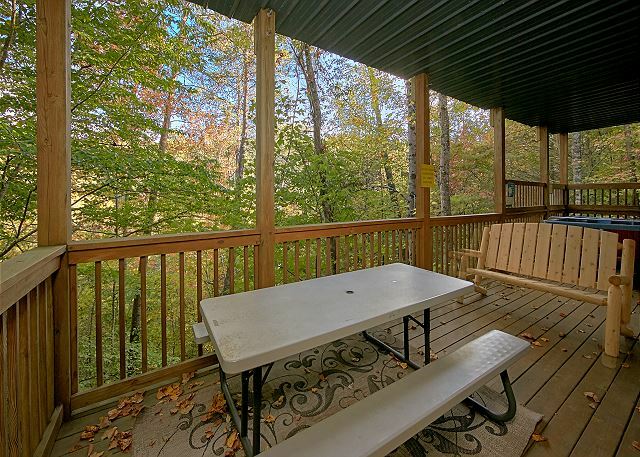 This cabin location is close enough to get to the Parkway in a few minutes yet up high enough to be in treetops. 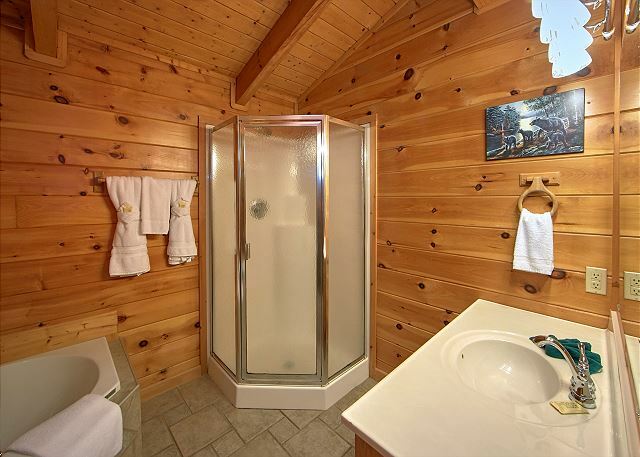 It is one of the cleanest cabins that we have stayed in. We hope to be able to stay there again. 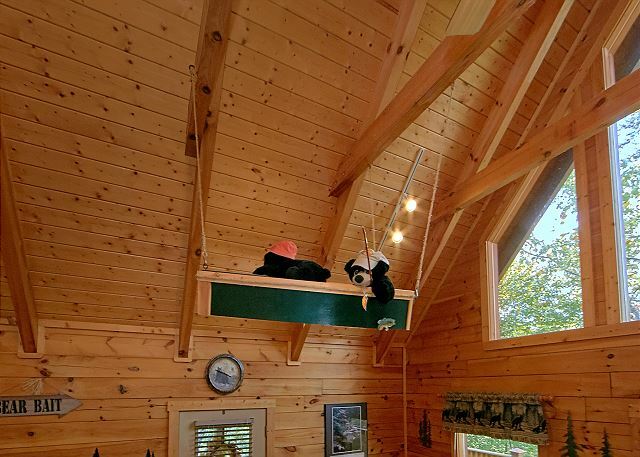 This is such a great cabin! It was very clean and we loved the bear theme throughout! Rental staff very helpful and friendly. Will definitely be coming back here in the future! very nice and clean cabin. 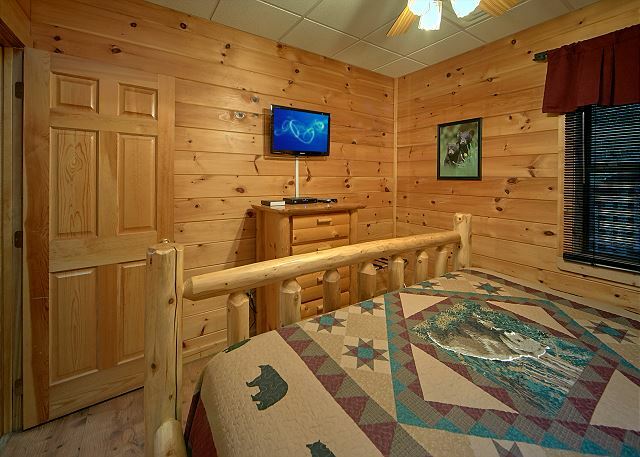 I would stay here again and would recommend to anyone wanting to stay close to the strip, in a peaceful cabin. 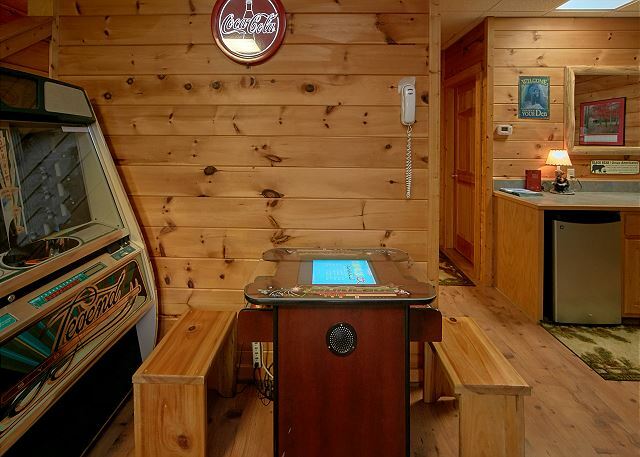 the only issues if I had to give, the jukebox was out of service, the window next to the pool table was broke and had a piece of plywood covering, the photos of the arcade game was not the same that was in the cabin. 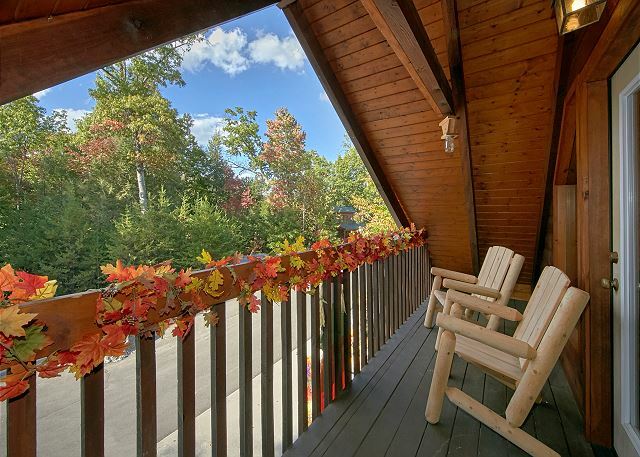 This being said, it is a very nice cabin with a great location and I would absolutely stay again. 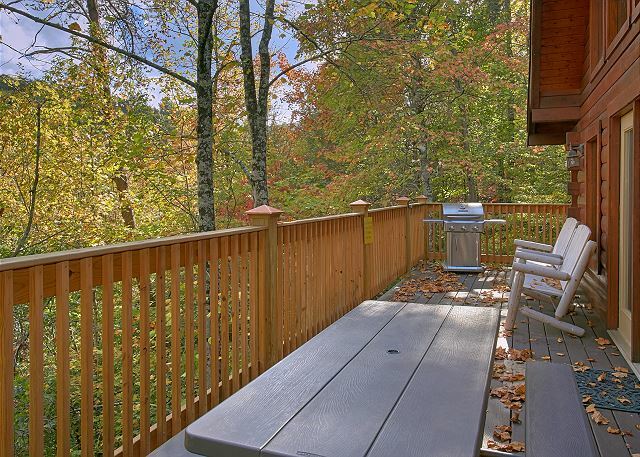 Close to Dollywood and convenient to all points of interest in The Smokey Mountains. 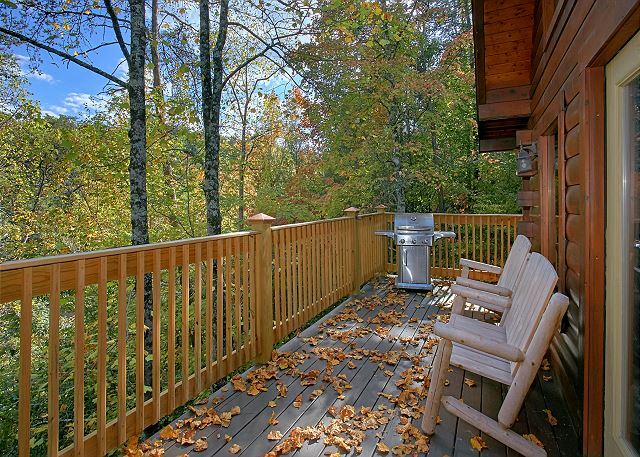 Beautiful setting with porches/balconies on all levels to enjoy sitting and relaxing outside. The theater/game room was a hit with all ages. Comfortable furnishings. 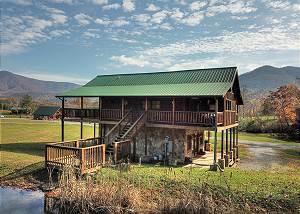 Been to Pigeon Forge multiple times, 1rst time staying in a cabin. It was very comfortable and clean. Nicely seclude, yet close to everything. Had a great stay. 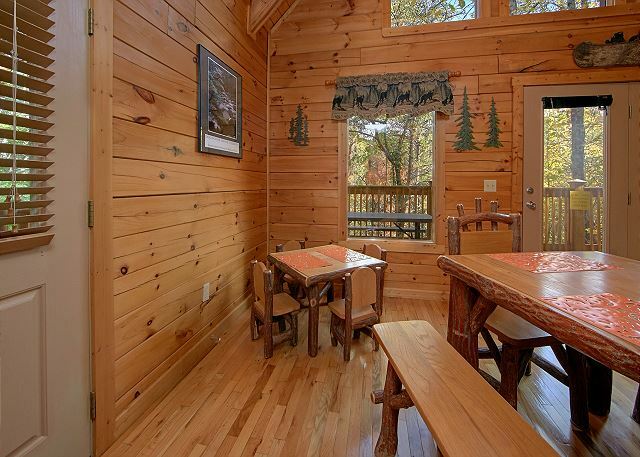 This cabin was perfect for us with great amino ties and close to everything. 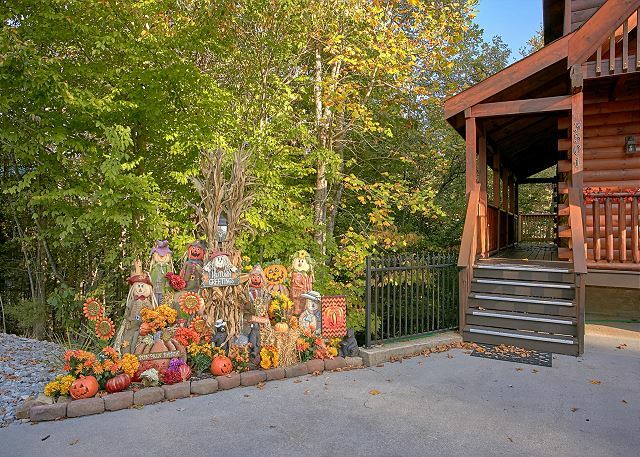 The owners take care of their cabin and decorate it nicely for the season. The staff at Aunt Bugs was friendly and pro-active. They called us prior to our late arrival to make sure we were taken care of. Will definitely stay here again! 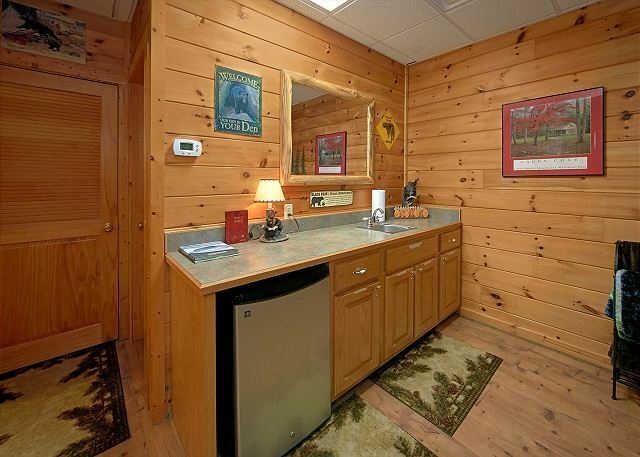 I loved the cabin very much and very well maintained and bear theme all over the cabin. We had wonderfull time in our stay!!!! 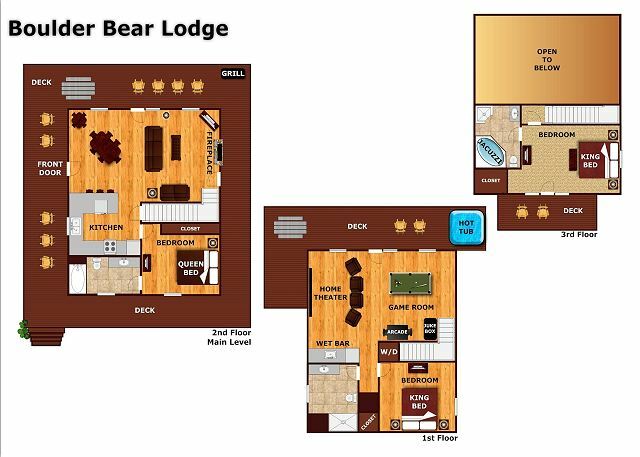 We loved our stay at Boulder Bear Lodge 355! We have booked through Aunt Bugs for the past several years and will continue to book through them in the future. They are very friendly and professional! We loved this cabin. You have everything you need right inside. We simply loved this cabin! Great location- not far from attractions but yet very quiet. You can't go wrong with this one! our kids and their families met us there, and surprised my wife for her 70th birthday. she was totally shocked. we had 3 days of enjoyment and bonding.the cabin was awesome and the grandkids had a ball. Going to make this an annual event. The cabin was an awesome experience. 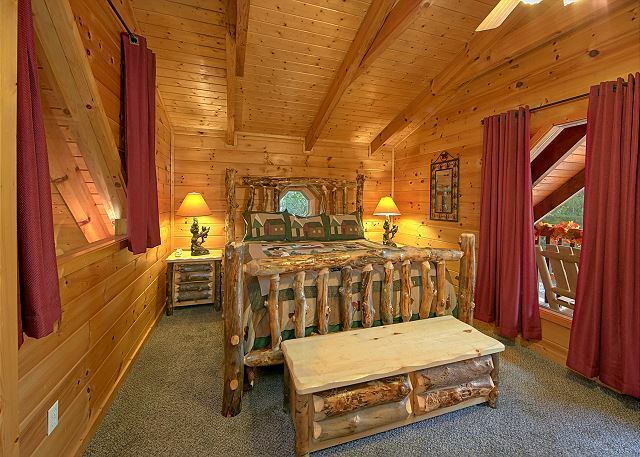 We could not decide on which cabin to rent for the week so the staff pointed us to this cabin. 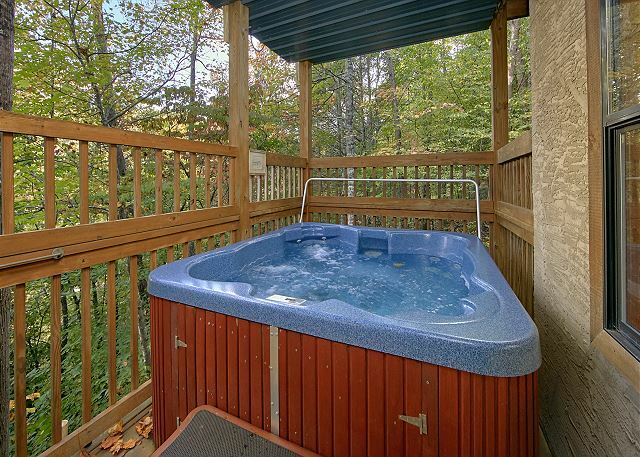 Great location, close to Pigeon Forge and Gatlinburg. The kids had a great time with the video games and the movie room. 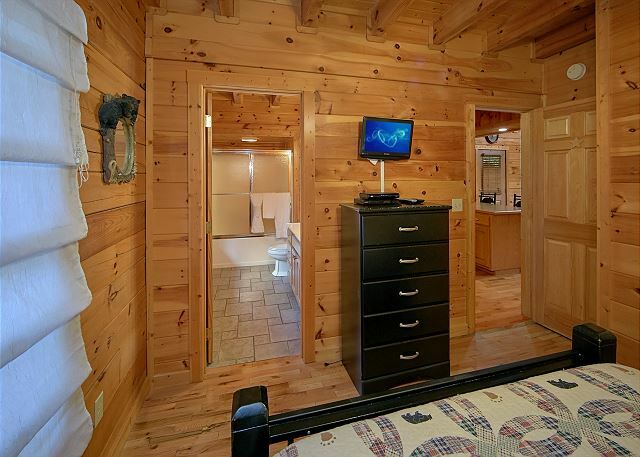 I would highly recommend this cabin to others. 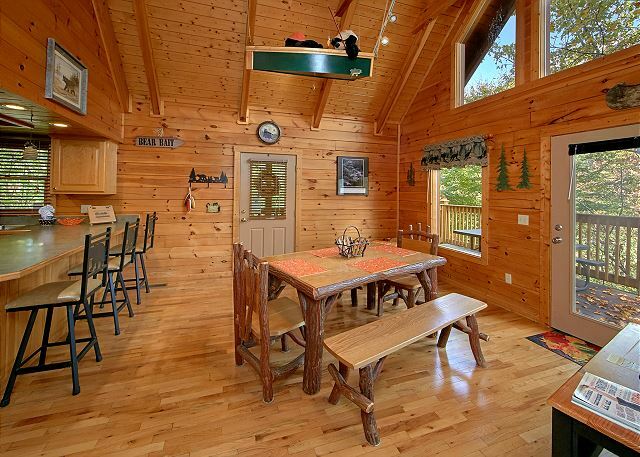 Great cabin, great location great visit. We stayed 4 days in this cabin and it was wonderful. 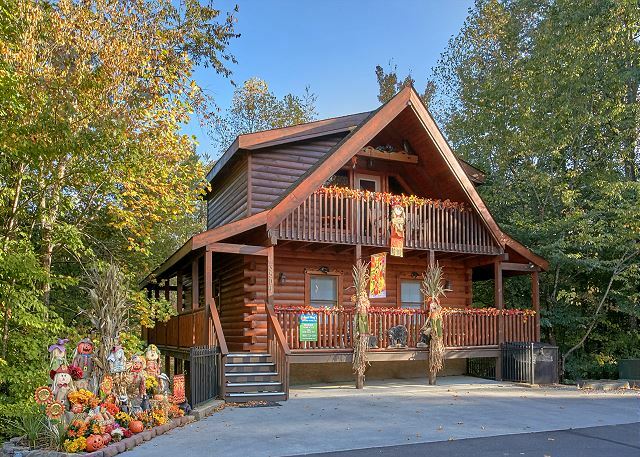 We have been coming to Pigeon Forge for 5 years now and this was the best cabin so far. Two teenagers in the basement and could not hear them. Most cabins are out in the country on curvy roads, but this cabin is 5 minutes to town down a nice road. WILL revisit this cabin. My favorite. Thank you. Our family really enjoyed our stay especially the kids. The rental was very clean and spacious. The master bedroom was amazing. We really liked the fact that we were only minutes away from the attractions. This was a last minute cabin rental because the other cabin we had rented was dirty. That cabin was not from Aunt Bug. Jeannie from Aunt Bugs was wonderful to work with and helped us pick out this cabin. It was a beautiful cabin, very clean, located close to everything. First time we stayed where a pool was available. Missed the mountain view. I would stay here again. Everything was very beautiful. The cabin was very homey and comfortable. This was my first time ever coming to a cabin and it was amazing. . We will definitely be coming back. Loved every minute of our stay. Very peaceful but very close to everything you would love to do hiking,shopping. Great getaway would stay there again.Thanks for a wonderful experience. Great area! Looks like a true cabin, nicely decorated, all appliaces included which was convenient, and very clean. Fire place is electric. Supplies given lasted us the entire three night stay. No complaints. Reservation was easy and directions that were given from the office where just right. Loved the view. Outstanding cabin! Very comfortable, great location. Exactly as described. Very much enjoyed our stay. It gave our family of four a wonderful place to spread out in the evenings after having a busy day outdoors. Loved the super big screen TV, jukebox, arcade game, and pool table in the basement area. Everything was clean, neat and organized. Excellent location! It was fabulous, the cabin was beautiful and the perfect size. It was clean and I truly felt at home. 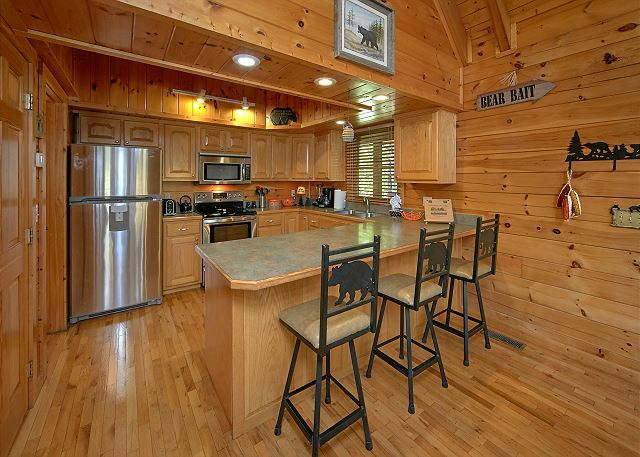 This cabin is great for all the family. 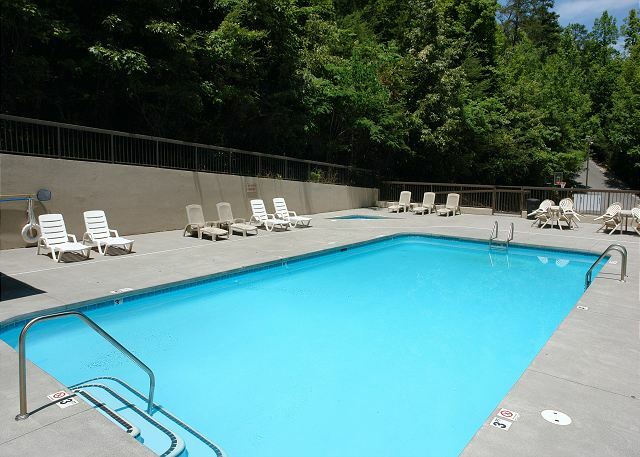 Has everything you need and close to everything in town. Would love to stay here again. Beautiful home. Plenty of space for my 6 kids. Christmas ready even for cooking. Only concern was not enough hot water capacity for showers in the morning. I would suggest an upgrade on the hot water system. Note steep hill access in winter although when we arrived there was no wintery conditions. 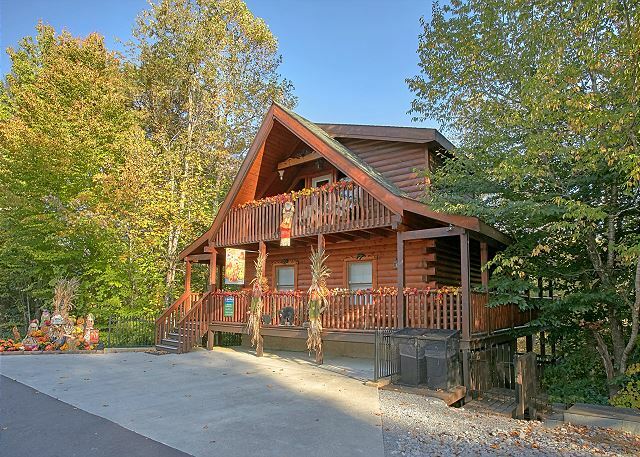 Located in pigeon forge not gatlinburg but you are on a mountain off the mainstreet. It was a beautiful cabin and very close to all attractions. We definitely will stay again if we get a chance to. Very spacious and not real close to anyone. Thank you all!!! The house was amazing. The kitchen was fully stocked and my children LOVED all the amenities. The location was great. I was also very pleased with how helpful the staff was at Aunt Bugs. Thanks for making this trip a memorable one for our family. We will be back! We had a great time and the cabin was awesome. Will definitely consider coming back! We enjoyed the cabin so much. The fall decorations were ao very pretty. The cabin was very clean. Also pne o the best parts was the convenient location. It was easy to get to to rest or drop things off and go back out again. We would recommend to anyon. My parents, brother, sister in law, husband, and 5 month old son decided to spend the weekend in a Pigeon Forge cabin as our big Christmas gift to each other. We are so glad we chose this cabin. It was perfect for 3 small families and was ideal for our 5 month old son. The only bad thing about this weekend was leaving on Sunday morning!!!!! 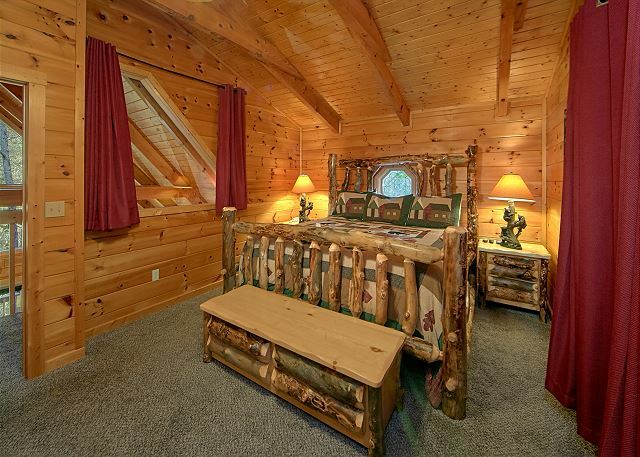 I would recommend this cabin to anyone!!!! Thanks for such a memorable weekend!!! 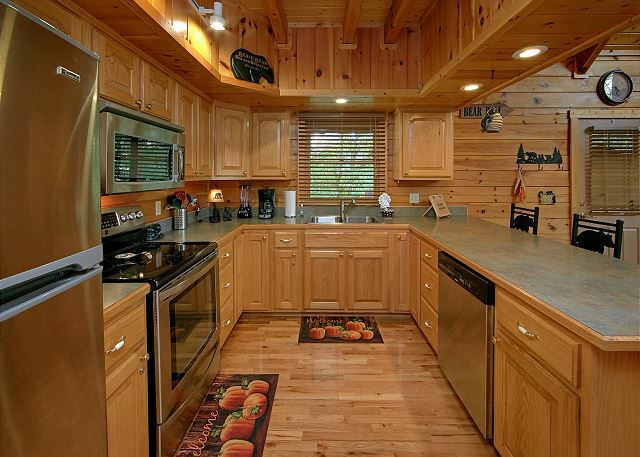 We loved the large kitchen that was well equipped. The size of the property was large enough to accommodate more than our party of six. 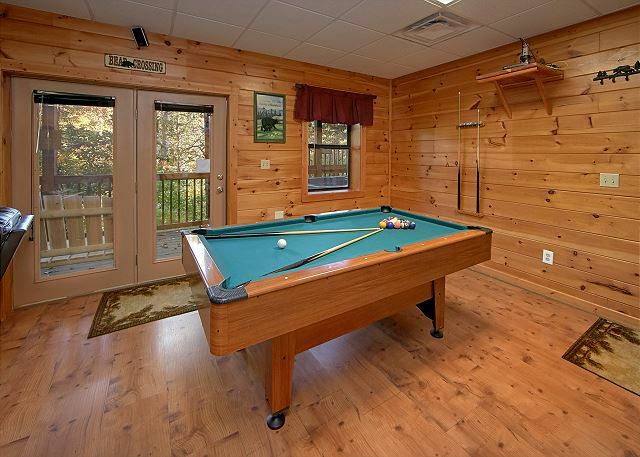 We especially enjoyed the game room and hot tub. The home was clean and had great furnishings. We hope to come back in the summer and will book this same home. There is only 2 complaints with this cabin. I've stayed in it several times. The issues are the Washer is very dirty. I went to Wal-Mart spent 13.00 on (affresh) the kit it says to use to clean it. Ran it with the cleaning kit 2 cycles. Then Clorox and used paper towels and its still fifthly dirty. The brown that was coming off when I wiped with a paper towel and Clorox wipes was so bad. I know nobody does cleaning cycles in it. We only washed the cabin towels and rags in it since it was to hard to get clean as we like. That would be great to have a deep clean on the washer once a month or something. Also the bathroom floor in the basement is "sticky" to your feet which makes you feel like its dirty. Not sure if you can strip any wax that might be on it or someday maybe replace it with a smoother non-sticky surface. We just laid towels over the floor to walk on because we didn't have our flip flops. The carpet on steps going downstairs is dirty too. 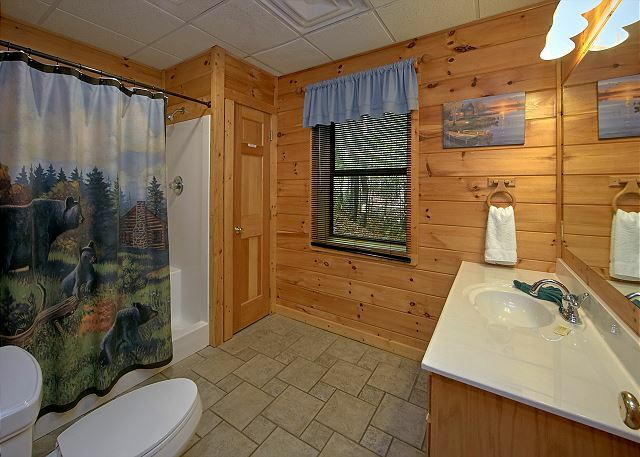 I really like this cabin and I'm not trying to be that customer that doesn't appreciate it. I surly do like it and I'm just very detailed and wanted to give you all the info I can to help improve it from a 4-star to a 5-star. Maybe a little bigger hot water tank for the basement shower since it has 2 heads (but again this isn't needed for a 5-star just a thought). Great Location - Decent Furniture - I own a furniture store if you need anything ;-) - Great Owners - Bible in Rooms so important - So much we like.